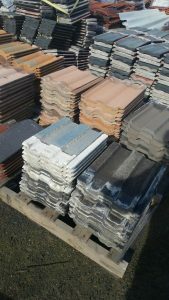 Here at WA External we are re roofing specialists and as a result for the activity we do we have second hand tiles available as and when they come up. We also do roof restorations which is painting the tiled roof, Please call the office 1300 660 978 and request the office as to your request for the second hand tiles. You can come to our office and collect, we do not offer a delivery service. The second hand tiles have come off a roof so they are as offered, some are painted, terracotta, we have different sort of used and second hand tiles.